A newspaper article in the December 20, 1987 issue of the Statesville Record & Landmark celebrating the 75th birthday of the John Mack & Son department store in Mooresville, NC. 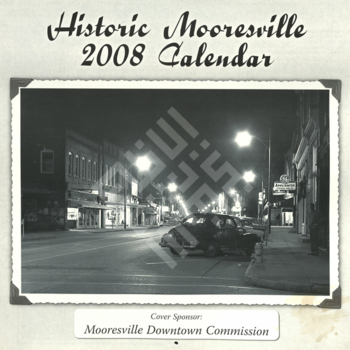 The 2008 Historic Mooresville Calendar, which featured archival photographs from Mooresville's history. The month of November was sponsored by John Mack & Sons Department Store and includes photographs of the family and the business. A photograph of Side Mack receiving a certificate, surrounded by a group of unidentified men. Side Mack with his grown children Madeline and Mitchell, posing together behind the counter at their family store, John Mack & Son. Though undated, the photograph was likely taken in the 1960s. The grand opening upon the major remodel of John Mack & Son, which took place in the mid-1950s. Second from left is Mitchell, next to his father Side, and sister Madeline. Other individuals in the photograph are unidentified. Side Mack, posing with his peddling cases in front of his family department store John Mack & Son.